Following on from the traditions of coastal Scandinavian fishing communities, Storm Gatherings have become a means for like minded paddlers to get together and celebrate a fruitful and rewarding summer on the water. 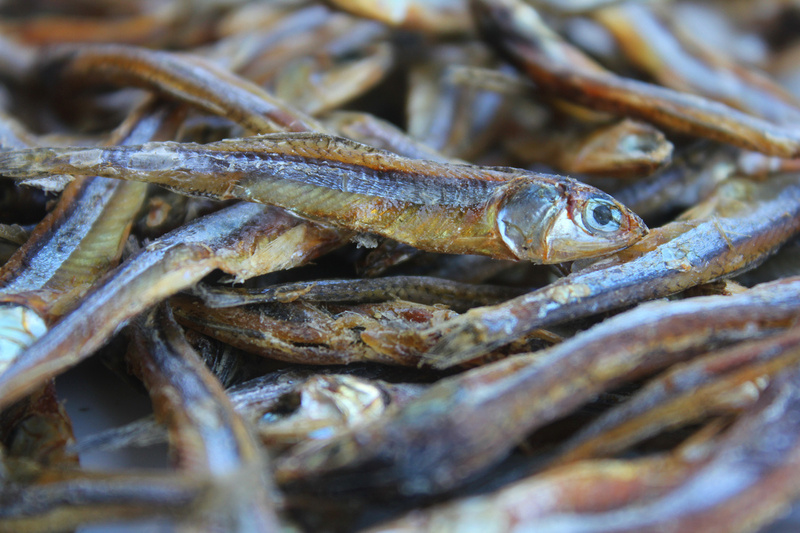 When grain, dried meat and salted fish in the village store reached a quantity that could sustain the people for the coming winter, a big party would be held. Now that the summer is over in the UK we kayakers have a similar celebration. We get together to compare stories, exchange tips and skills, then wash it all down with a healthy glug of ale. UK Storm Gatherings take place in different venues form one year to the next. Wherever the venue, excellent paddling is always followed by unparalleled partying. 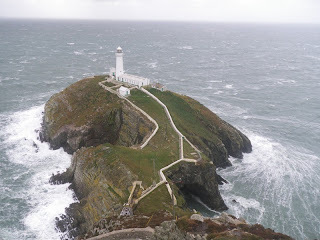 This year’s venue was the Anglesey Outdoors Centre and the organizer was the eminent Dr Mark Tozer. 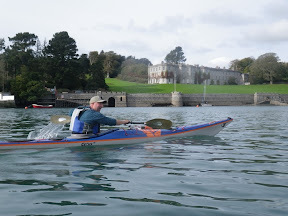 A couple of days before the event, I launched onto the Menai Strait to have a bash at the Menai Challenge. Although not record-breaking, my time of 1 hour 52 minutes and 49 seconds was deemed “quite respectable”, by the challenge creator, John Willacy. On the eve of the Storm Gathering I met with Tim (who had arrived a day early) and Paul Kuthe who I had met off the ferry the previous evening. We paddled the rockhopping coast between Bull Bay and Porth Wen. Just as we set off from the bay, channel 16 crackled out the words “securite, securite, securite” which preceded a gale warning. Our coast was relatively sheltered but there was plenty of swell to make the rockhopping excellent. When we arrived back at the centre we found people were already arriving. This meant that it was time for me to get organising the evening entertainment. With the help of Barry Shaw, Andy Morgan and Roger Chandler I organised a series of short films and slideshows in the main centre so that there was always something happening as folk arrived. On Saturday Morning the gale was still raging from the south. 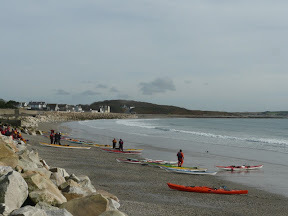 Brave paddlers emerged from Trearddur Bay and peered into its teeth. I conspired with Greenland expert Martin Rickard to head north and hide in amongst the rocks that I had visited the day before. Anglesey’s north coast proved an excellent choice once again. Rockhopping is not only good participation sport but doubles as an excellent spectator sport. The few reluctant barnacle dodgers were soon bitten by the bug. The apres paddle took the form of a sea kayakers pub quiz combined with a celebrity quiz show that featured various embarrassing party games. The evening descended into chaotic rapture when Kate Duffus and Justine Curgenven competed for various items of kayaking equipment whilst bound and blindfolded. The ultimate item was a pair men’s long johns. The paddling on Sunday was a little subdued but no less fun. It was difficult to feel motivated to go the the evening slideshow by Jeff Allen. However, his account of the record breaking circumnavigation of Ireland with Harry Whelan was a real eye opener. 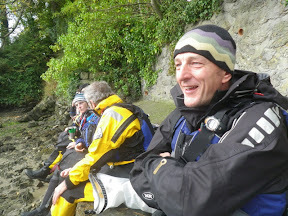 Sunday was wind down day and with a southeasterly force 9 on the forecast I took my group to the Menai Straits. During the rest of the week there have been a number of BCU courses held and Facebook has been ringing with various chimes of ‘I passed!’ What A terrific event! For the third time now, my end of summer trip has been to go to Maine to Sea Kayak the coastline and the islands spattered around it. 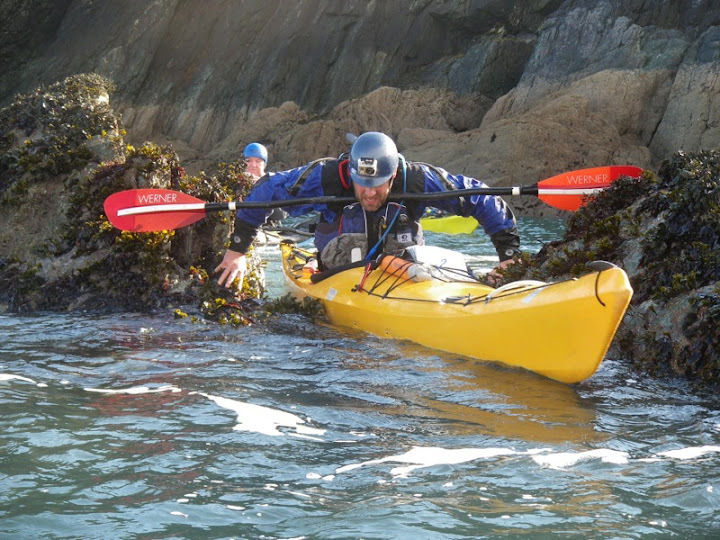 I would be going with a long time friend and fellow instructor for as many times and after circumnavigating Acadia National Park last year, we wanted to do something more challenging. 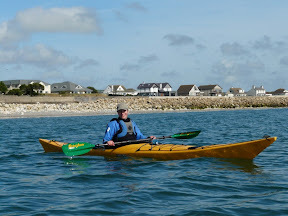 We chose to paddle off from Bar Harbor in the general direction of Canada and just poke around where we felt. We had 11 days and I would be paddling my Cetus LV and Brandon paddled his MV. We were able to comfortably pack enough gear and food for the duration of the trip and all most enough water. I knew we would need to refill once while we were out. We were departing from Bar Harbor while the fog was rolling in and by the time we were in the boats the cruise ship that had been there was now gone and so were some of the Porcupine Islands. The entire way out out Frenchman’s Bay the fog continued to roll in. Relying on compasses and our chart to find our way out we rounded Schoodic Peninsula and began to look for a place to camp. The swell was a gentle 2-3′ but with the fog made you stay alert around the rocks. Camp sites were looking grim and then after what seemed like forever trying to get to a decent location the fog lifted revealing Schoodic Island which had a rock beach on it and a spot to set up camp. We reluctantly got back in the boats and made the paddle across. Not the best location by far but 100 times better than where we had come from. The next day we paddled out toward Petite Manan and as fog rolled in with being wiped out from the fiasco the day before we took up camp in the Sally Islands. The fog continued to roll in making the “scenery” portion of the trip non existent. The next morning was even worse and after waiting a few hours to see if it would lift we made the disappointing choice to spend the day there one more time as it wasn’t supposed to be as foggy the next day. The next morning it was clear as a bell and, looking forward to pressing on, we made a mad dash downwind run across the bay and rounded Petite Manan Point. Once around we had the same 15-20knt wind right in our faces. We spent the next few hours darting the wind as we headed up the coast arriving on Bois Bubert Island. A rocky landing but in lee of the wind for at least two days we pulled up to the North side of the cove and pulled our boats way up on the rocks to avoid the 12-14′ tides from taking them from us. After exploring a bit and hiking up the 65 foot cliffs we set up camp with the most amazing view I’ve ever had. To the left was a huge granite and slanted cliff face and to the right were the Douglas Islands and Jordan’s Delight, a seabird nesting island. The next morning sunrise came over Jordan’s Delight and made the sky violet with a bright burning sun. We timed the break that morning in order to leave the “beach” in one piece as a 4′ breaking swell was casually dumping on the rocks with 30-40 second intervals between sets. Plenty to hop in and paddle off quickly. We spent the rest of the day exploring the Douglas Islands chain including Shipstern and the Pot Rock en route to Stevens Island our intended destination. Missing the Maine Island Trail camp site we ended up camping in an area where the low tide kept us on land much longer than we wold have liked. Once the tide rolled in we departed and headed to Jonesport to restock on some items. Amazingly the one store we found did not sell water and people we scarce with hoses shut off for the winter. None of the guys at the local wharf seemed too interested either so we set off with less water than we would have like but enough for another two days with many harbors to hit on on way back. We stayed the night on an island close to Jonesport and were rewarded with a wonderful sunset. The next morning we took off back in the direction of the Douglas Islands. After a lot of paddling in the wind we stopped to check out Jordan’s Delight, a magnificent 95′ cliff island that sticks out of the middle of the bay and is a seabird nesting site. The island is closed to the public from April to August. Later we found camp and got to sleep early. Waves kept me up most of the night and I wondered what the next day of paddling would be like. We got up early and watched what looked like miserable weather and suited up for the conditions. The wind was blowing a steady 15 and gusting to 20knts again. The seas this time were much larger and what looked like moving houses were moving down the cliffs of Jordan’s Delight. We decided to paddle the back way around Bois Bubert in hopes of finding an escape from the wind. It offered some but not enough as we paddled slowly back towards Petite Manan Point. The seas were building and the wind a steady 20knts at this point. The next day was supposed to be bigger so we decided to round the point and get the 2nd worst headland out of the way. Seas were 7-8′ and breaking all around. The area between Petite Manan Point and the Petite Manan Light (Island) is roughly 4-15′ deep with the surrounding water anywhere from 50-125′ around it. This goes out for almost a mile. Waves came from each and every direction and my kayak spent as much time in the air as it did in the water. Thankfully the Cetus LV packed with all my gear and me at 170 pounds navigated around it marvelously. Now around the point I surfed the large following seas to safe harbor on Dyer Neck and called it a day. This was supposed to be the day we were going to get water and do to the lack of it in Jonesport and the weather today it did not happen. We boiled our rice in sea water that night dumping out as much liquid as possible when it was done and saved the water we had for drinking. Getting water the next day was a must though. Good weather greeted us the next morning, ironically, and after a short hike we put the weather to use and took off. First harbor we checked for water was Corea and they were the complete opposite of helpful. Pulling next into Prospect Harbor we finally found someone who was home and a very kind woman let us refill out Dromedary bags. Feeling fresh after some tall glasses of ice water we pressed on rounding Schoodic Point, something we were dreading if the weather was bad, and paddled up to Turtle Island where we did our last night of camping. We awoke the next morning to a heavy rain which then turned to thick fog. Fitting the last day would be similar to the first. We re traced our steps and paddled back to Bar Harbor and eventually to Haldey Point where a friend was keeping my car close by. We spent the night at a motel, got cleaned up and enjoyed the local atmosphere and food then headed home the next day. Spectacular trip. 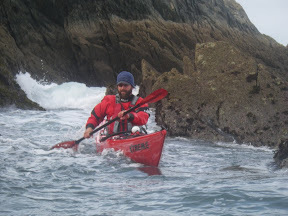 The Isle of Man has been a favourite kayaking destination of mine since I attended a symposium back in 2006. The warm welcoming nature of the people here along with the stunning coastline keeps me coming back for more. If only the weather could be relied upon! On Saturday, Kirstine and I joined Nico and Jukka’s group for a short trip along the south coast from Port St Mary. Throughout the day Nico and Jukka along with local guide, John Keggin dispensed valuable wisdom and a host of top tips to keep everyone informed and entertained. After a blustery grey start to the day, the skies cleared to reveal a breezy sunny day with blue skies. The overnight winds left us with enough swell for some challenging rock hopping and some fun in the surf. 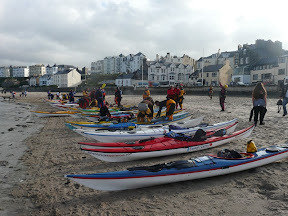 Sunday brought in freshening winds from the south so the west facing inlet of Port Erin became the venue of choice. Hangovers were soon cleared making way for more action on the water. More skills sessions including four star training culminated with more surf action in the bay before many of the paddlers began heading home. In the meantime Kirstine and I are staying on for the following week for some more adventures.